We are at a terrifying transition of consciousness, and this transition faces enormous resistance, primarily at the institutional level. If we believe in a society that is more humane, more empathy-driven, than the one we have now, we are on our own and easily marginalized by the powers that be. This is our challenge: to find one another and start building a humane, sustainable future! I mean this website as a link in this process. 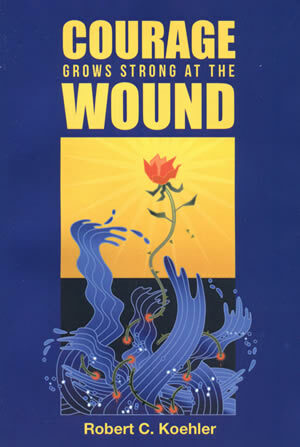 Courage Grows Strong at the Wound is a collection of essays – secular prayers – about the world we are becoming if we reach out to one another in love and creative openness rather than stay imprisoned in fear and denial. We have two choices: to strive for power with one another or power over one another. These essays originally appeared as syndicated columns (prayers disguised as op-eds), beginning in 1999. They are about grief, wonder, politics and peace.